Apple Inc. is the most admired company in the world. It has been the most admired, according to Fortune magazine, for four straight years. Apple is the most competitive and the fastest changing market space. In 2010 its revenue was $65 billion and its net income was $14 billion. Its stock price has been as low $1.82 a share and today it is over $350 a share. When we look for a business strategy, what are we really looking for? A business strategy is the “how the business plans to get there.” The “there” can be the goals that define what you want to accomplish. To really understand the business strategy of Apple, we need to understand its story. One story of Apple is that of Steve Jobs. His story is one of hope, a dream, excitement and brilliant success. However, it is also one of over-confidence, trials, and failure. The story of Apple is a real human story – one that applies each of us. Apple is what it is today because of the refiner’s fire it went through and persistence. Its key to future success will depend upon its adherence to fundamental principles. In Jim Collins’ landmark book Good to Great he shares important findings from his five year research project where he and his team compared companies that made a leap to greatness those that did not. Greatness, he explains, is matter of conscious choice and discipline. One of the most important points Jim emphasizes is the “hedgehog” concept. A key to greatness is finding the intersection, or the sweet spot, of where your passion and strengths, intersect with economic opportunity. Jim’s diagram helps to illustrate these points. 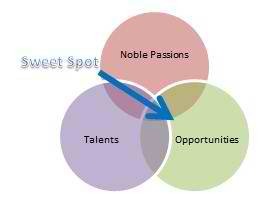 When your passions and strengths are focused on providing the best value possible to others, then you have found your sweet spot. When Apple stayed focused in balanced way on their sweet spot, they excelled. When the focus was on profits first, they flourished for a period but then became arrogant, and began to descend quickly. (For more information on this important topic visit How the Mighty Fall.) When Apple concentrated on their passions at the expense of the practical needs and of the customer, they failed.